Based in Lakeville for three years now, Post Cereal is taking advantage of our creative workforce – especially our musical resources – in a guffaw-inducing new online ad issued today for National Cereal Day. Minneapolis-based advertising and marketing agency PublicWorks tapped some local music scenesters to craft a family-size bundle of ‘80s-cheesy commercial jingles for Post. The hopelessly sugary snippets -- i.e., "(Honey, I Was Maid to) Love You 'Smore" for Honey Maid S'Mores -- were gloriously compiled for a record called “Breakfast’s Greatest Hits,” which is the subject of the faux infomercial (“fauxmercial?”). Among the musical contributors, who sound like they’re having a blast in the ad, are: local singer/songwriter Aby Wolf, formerly of Dessa’s band and a star in her own right; one-time Hang-Ups and Papas Fritas member Bryan Hanna, whose company NoWare Media helmed the music; Hanna’s former Terrarium Studio co-worker Eric Olsen, who played in Arson Wells and has produced for the likes of Lifter Puller and Dillinger Four; and End Transmission guitarist Casey Nelson, who also handled some of the vocals in the fauxmercial and is part of the PublicWorks creative team. 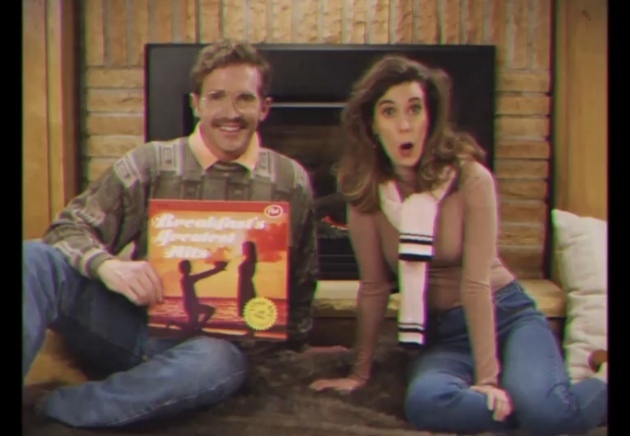 Looking like something you'd see during "That's Incredible," "Barney Miller" or "Soap," the VHS-quality ad pays homage to a former Minnesota mega-brand, K-Tel Records, as well as to Time-Life infomercials for oldies music collections. It follows another whacky musical Post ad from PublicWorks that went viral this time last year. To paraphrase a cereal ad not featured here, go nuts watching this one.